This tour was created with the mission of providing happiness, surprises, and cherished memories. You're sure to be the center of attention with this special golden mini-car! 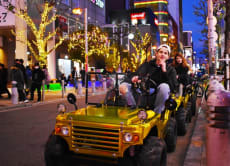 Enjoy the tour with a professional guide who will make your Osaka tour unforgettable!